Okay, so the above is a bit of a opinionated statement but one that I personally think rings true. 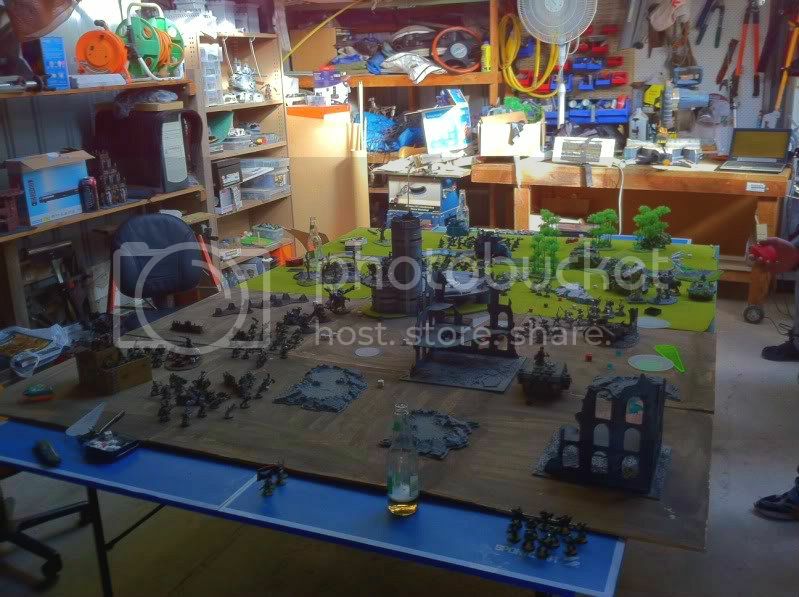 The scenery pieces and the table they sit upon is what can turn your game of "plastic men shooting each other from behind book piles" to "a bloody encounter between two heavily armed forces on the Imperial Forgeworld of XYZ etc". Simply put, scenery is what sets the scene. I understand that the above paragraph may have some of you nodding your head in disagreement, but for me the lure of the game is the fact that we arent just rolling dice and using tactics to beat an opponent's forces- there is plenty more simplistic games out there that cover this requirement off without needing the spend the time and effort required for 40K. 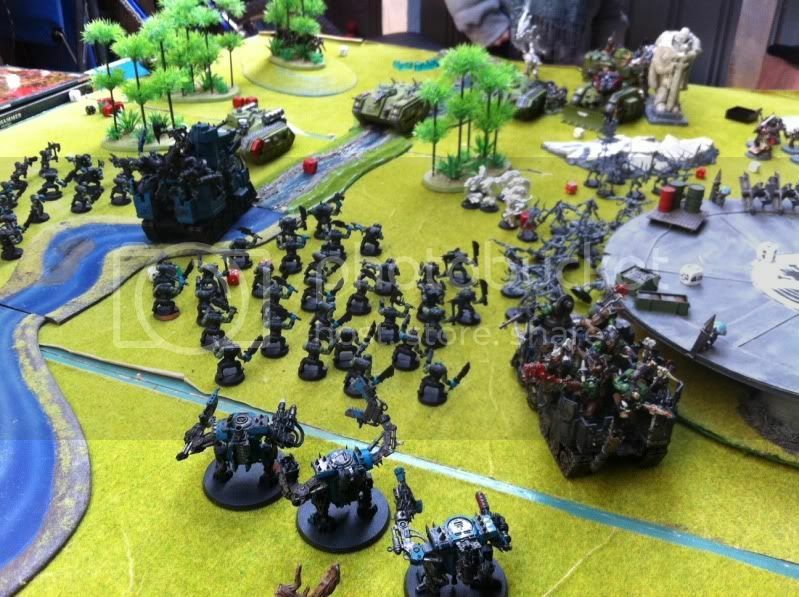 No, we are creating (or re-creating) a battle in the 41st millenium, in one of the richest sci-fi backgrounds thus created, so I feel that games should strive to be as immersive as possible- you aren't just looming over the table all god-like and omnipotent, you are down there with the men at ground level, seeing whats going on. And at eye level, thats when you want to see the nice stuff. they help to set the scene. Speaking of setting the scene, i went to a 3 per side team game last weekend at a friend's place. Whilst the majority of his terrain and scenery is GW store-bought, some pieces like the landing pad were scratchbuilt- all of them were fully painted and detailed though, and it was great. Playing on a table with flocked grasslands on one side and cratered wastelands on the other was great- we augmented this with some of my hills, trees and buildings that i brought along. We also had an Ork settlement in one corner, the aforementioned landing pad as our central objective and a river running through the green side of the board- this all added up to a great setting for our battle. The game specifics were 1200pts per player, and comprised of "team evil" with the Deathskull Orks (Me), Goff Orks (Adam) and Daemons (Colin). 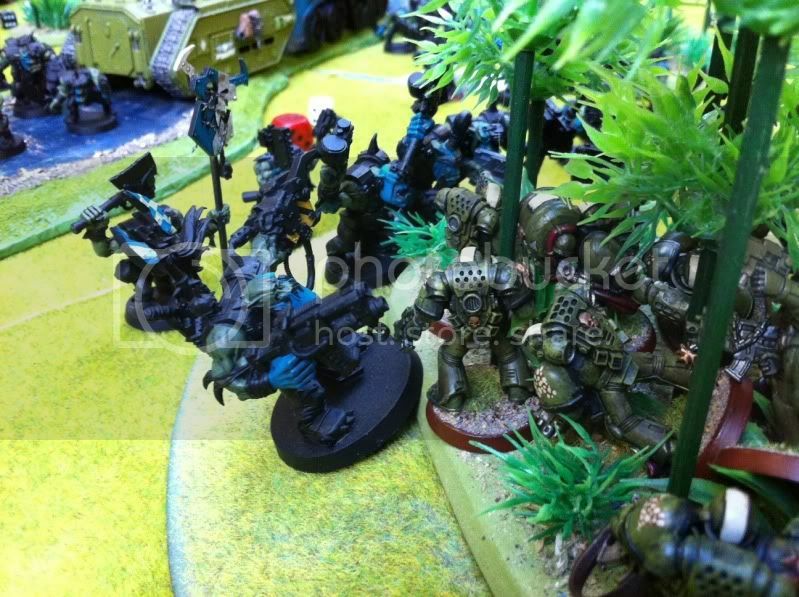 "Team Good" was comprised of Salamanders (Ash), Grey Knights (Brendan) and Imperial Guard (Claire). Although the first few turns were decidedly in Team Evil's favour, it balanced out in the end with one objective a piece and the last one contested. 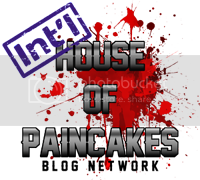 Was a hugely enjoyable game, with no hassles, no powergaming and no arguements. 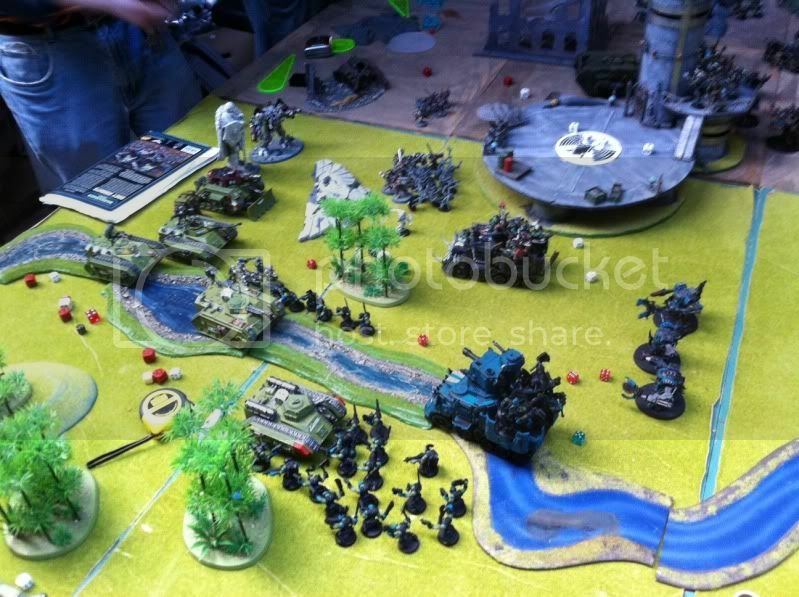 Playing 40K on a table like this, with beautiful themed terrain pieces-thats what the hobby is about for me. The board- nice terrain and tertured game surface pieces! The Battlewagon drove up the river the whole game, ploughing onwards with its reinforced ram! 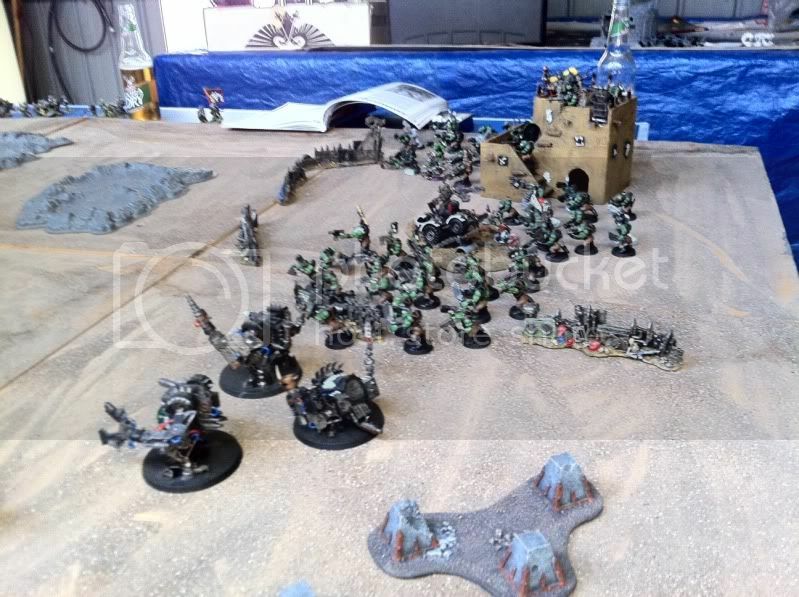 Adam's Goff Orks, at deployment.